The Opticron MMS 160 image stabilised Travelscope is the latest addition to the Opticron travelscope family and offers users a unique opportunity to enjoy variable magnification close up views of flora, wildlife and other objects at distance using a hand held device. The image stabilisation system incorporated into the MMS cancels out image-shake or tremor caused by the body when viewing at magnifications of 10x and over. The results are a stable, clear and comfortable hand held viewing experience. Supplied as body only the MMS is compatible with a wide range of Opticron eyepieces including the SDL v2 7-21x, HDF T 7-21x and HR3 8-24x. 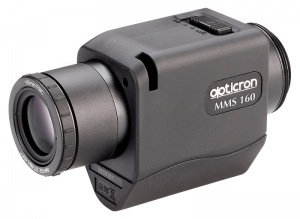 Measuring 120x70x45mm and weighing 280g without eyepiece, the MMS fits neatly into a coat pocket, handbag or backpack. Requires: 2x CR2 3V Lithium for up to 30 hours use. MMS Travelscopes are supplied in body only format with integrated objective lens cover and adjustable hand strap. OK, maybe you need a larger pocket, but still very portable. I purchased mine with the HR3 zoom eyepiece. Fors: Usual quality manufacture from Opticron. Very quick and easy to focus on your subject. Superb optics for the price. Sharp image throughout the zoom range. Image stabilisation is switchable on or off. Not much on the market to compare with so fairly unique product. Against: Image stabilisation is not as clear as I'd like it to be, but certainly stable enough to identify your subject at higher zoom levels though. Wish there was a dedicated carry case or pouch or stay on case available. I know it's designated as hand held, but I'd like to see a tripod mounting fixture on it. Overall a very nice addition to my kit and would certainly recommend it to anyone requiring this kind of scope.